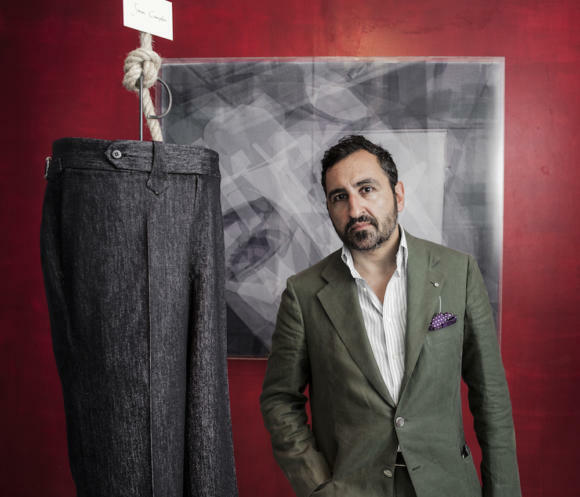 Lino Pommella recently became the latest entrant into a group of travelling, Neapolitan trouser makers - a path forged, of course, by Salvatore Ambrosi. The other notable one is Cerrato, whom we have covered elsewhere but who only currently travels to London. Ambrosi travels the world, and Pommella currently visits London, New York, Tokyo and Osaka. There isn’t that much to separate these trouser makers in terms of finished product. All use extensive hand finishing, with scatterings of bar tacks, pick stitching up the outside seams and so on. Indeed, this finishing is the thing that largely separates them from the Neapolitan tailors that they also often make for. The tailors don’t tend to offer such finishing, believing (perhaps rightly) that the jacket is more important. Those tailors can, however, often offer such finishing if requested - and it’s one way to access trousers such as these if a maker doesn’t currently travel to your city. It’s something I did with my Pirozzi cord suit, which had trousers made by Cerrato. Lino Pommella worked as a trouser cutter at Rubinacci for 10 years, and his father was also a trouser maker. He does not come from an independent house like Ambrosi or Cerrato, therefore, but it is still a family business. He also has one significant asset in Gianluca Migliarotti (above). The lovely and talented Gianluca is best known as the filmmaker behind O’Mast and I Colori di Antonio, documentaries about Neapolitan tailoring and Antonio Liverano respectively. But he is also an investor in, and marketing force behind, Pommella. His rich style has led to a lot of developments with Pommella so far - in particular the designs that myself, Mark Cho and Antonio Ciongoli made for a display at Pitti in the summer (pictures below). Mark's design is even planned to become a ready-to-wear style for The Armoury. As I have often said when describing artisans such as Lino, they have a tendency to underestimate the importance of style - and it was always a part of the attraction with Ambrosi. Gianluca’s involvement is a big plus, therefore, whether present at customer appointments or simply guiding behind the scenes. Lino made two pairs of trousers for me earlier in the year - one in green linen, the other in vintage Fox Brothers wool. The latter material was one we featured in our pop-up shop in the Spring, part of a series of vintage bolts that Fox brought up and sold in the shop. It is therefore not currently available (although they are looking at reweaving it). The trousers were, overall, very good. The fit was spot on, after just one fitting in London. Perfect in the waist and through the seat, with a nice line down to the cuffed hem. As ever, I warn against concluding anything as regards fit from the photography. I could spend 20 minutes arranging them so they look perfect, but that seems disingenuous. Fit is something readers largely have to take my word on. What you can see, and is interesting to me, is that there is a subtle difference in the leg line that Pommella naturally cuts, as opposed to Cerrato or Ambrosi. These trousers actively narrow from the middle of the thigh down to the knee, before running straight to the bottom. This creates the impression of a rather narrow leg, with even a slight kick in the ankle. When we profiled Marco Cerrato in his Naples atelier in the summer, he said that he tends to prefer a roomier leg, so narrowing less sharply at the knee, but tapering consistently from the seat to the bottom. To an extent you can see this on my review of his trousers here. Ambrosi’s styles vary far more, but on balance I’d say he sits in between these two. I should also emphasise that this is merely how Lino would cut the trouser if not directed at all by the customer. Any line is possible, and most would request taking in or out, tapering more or less, at the fitting stage. I deliberately made no requirements there. Readers have also noted that these trousers have pleats, which I usually avoid. This was the result of a direct challenge to Lino. I described to him and Gianluca the issues I normally have with pleats, with them largely opening and staying open in any cloth, due to the size of my thighs and seat, and a low rise. Lino said he was sure he could make pleats that didn’t have this problem (several others have said the same, and failed) by deepening the pleat, putting in more material underneath. The result is very good. Better than any other tailor has achieved. I still don’t generally like pleats except on high-waisted trousers, but as a technical point this was impressive. It’s also worth emphasising that the Pommella trousers were exactly what I ordered - right cloth, right design - and the quality is good, with no buttons or anything else coming loose. Given the issues previously with Ambrosi and some other Neapolitans, this is more important than it should be. The only issue we had with the trousers was that a 4cm canvas was used in the 5cm waistband. This means that the top of the waistband collapses slightly, as you can see in the images. It’s an issue we’ve covered before. Canvas for waistbands comes in standard 4cm-width strips, so the only options for a tailor on a wider waistband are to still use this, or to find an uncut roll of canvas and cut it to 5cm. Cerrato does this as standard, and I’m pleased to say Pommella has now changed his practice and does it too. I’ll get him to change these trousers at some point. Overall, I can certainly recommend Pommella as a solid option for hand-finished Neapolitan-style trousers. The product was solid, hecares about his work, and if I didn’t have Cerrato visiting London frequently, I would probably start using him. In terms of price he is more expensive than Cerrato, and a little cheaper than Ambrosi. When Pommella visits The Armoury in New York, bespoke trousers cost $1100 through the shop. In the UK, in trunk shows, they cost €850. He is now travelling frequently to New York (every two months) and is looking to expand to other US cities. The next trunk show there is November 16-18. London and Japan are less frequent. The next is Tokyo and Osaka through Strasburgo, December 2-4. You can follow the discussion on Pommella bespoke trousers – Review by entering your email address in the box below. You will then receive an email every time a new comment is added. These will also contain a link to a page where you can stop the alerts, and remove all of your related data from the site. Although I don’t share your obsession with lighter coloured trousers – I think they are close to unwearable in the U.K. – I like the cut of these a lot. That said I would be interested to know how you would compare them to the pair Edward Sexton made for you in terms of quality,fit and value? Interesting article, thank you! Also, how would you compare these pairs to the trousers made by The Disguisery for you recently? More flannel! At least three colours there (mid, pale, charcoal) and potentially different weights (get one really nice and heavy, 15 ounce plus). I agree. But why stick with grey?! I’ve just had a lovely pair made using flannel from Minnis in a lovely hazelnut colour. Absolutely love them! Interesting. I already have 3 pairs of flannels. Which fabric producer does a good covert? A lot do. Holland & Sherry (Dakota bunch I believe), and VBC too. Covert cloth is a coating. Whipcord ( which is what you refer to in the H&S bunch, is more commonly used as a trouser ihg. No worries. Obviously cloths can be used for anything you want, within reason. Is there any technical difference between covert and whipcord? Both tightly woven steep twills. Mid grey whipcord Smith Woolens SW2589 X (15/16 oz) might be an alternative. At least, that cloth was suggested by my tailor, when I said I like the look of flannel, but not the feeling of it (too warm & fluffy). Another alternative might be the Salt and Pepper 8744 (14 oz), by Drapers I believe, the cloth is a little more interesting but not as hard wearing, I was told. The cut of the lower leg is very different to Cerrato’s house cut, indeed. Iv’e just ordered three pairs of flannel from Marco btw, in charcoal, medium grey and light grey. Minnis flannel. Hopefully I could use them more than three weeks a year. Probably I’ll end up orderind some worsted flannels in lighter weight too. What would you reccommend, Harrison’s or Fox? Simon, the problem is that in some climates woollen flannel is almost unwearable. With temperatures around 20º degreees celsius 9 months a year, what would you recommend in transitional weather? Cavalry is normally heavyweight and gabardine or venetian lack texture. Simon, how have the Thom Sweeney corduroy trousers held up? Do you still wear them? I’m curious because I plan to order a bespoke suit soon. The make and fit has been great, but actually I find I don’t wear the colour as much as I thought I would. How do you keep the cream trousers clean, Simon? Do they not show dirt very quickly, especially living in London? I find it hard to believe they’d survive a a trip on the tube looking pristine. Well, they certainly need more casual looking after. So worth brushing down after each wear, and having confidence in your dry cleaner. I would also be more careful about wear I was sitting etc. Only a clean-looking tube seat! That leg line is nice and interesting. Is this the way he would typically do it? I wonder how it’d change for people with bigger calves. Yes exactly, that’s typical but he can do anything. The calves would actually be pretty much the same with any styles – the difference is in the lower thigh to the knee. Great fit and finishing. No need to argue on the technical aspect. But honestly paying 1k euros (for Ambrosi) or 850 euros (for Pommella) for trousers seems absolutely grotesque to me? I personally earn well my life but I think it isn’t superfluous to have an ethical reflection when you buy garments, bespoke or not. At that price, even if you take in account the overheads of a trunk show, the margins must be enormous (far beyond the Apple margin of 40%). You’ll find great tailors in Naples to make bespoke trousers with the same quality (less useless bar-tacks I recognize) for less than 200 euros. Thanks David. Odd, though, how people are far less likely to complain about a 5k suit. Trousers certainly justify a fifth of that cost. And the margins just aren’t that high, especially with travel. I know a trouser maker in London that used to spend approx. 2 days on one pair. During her training it took her a week. Within the craft, she was recognized as a talent, but the thing was she could not make a living of it. People didn’t want to pay for her precision, they did not want to recognize the working hours involved in the process of getting things right. Instead, they were complaining about the price, Consequently, she has stopped as a tailor. She’s in RTW now. Nobody’s complaining. And she earns much more. They look very nice. How wide is the trouser opening (is there a better english word for this) at the bottom. 19 or 20 cm perhaps? 18cm? That is only just a touch more than 7″ Are you sure? 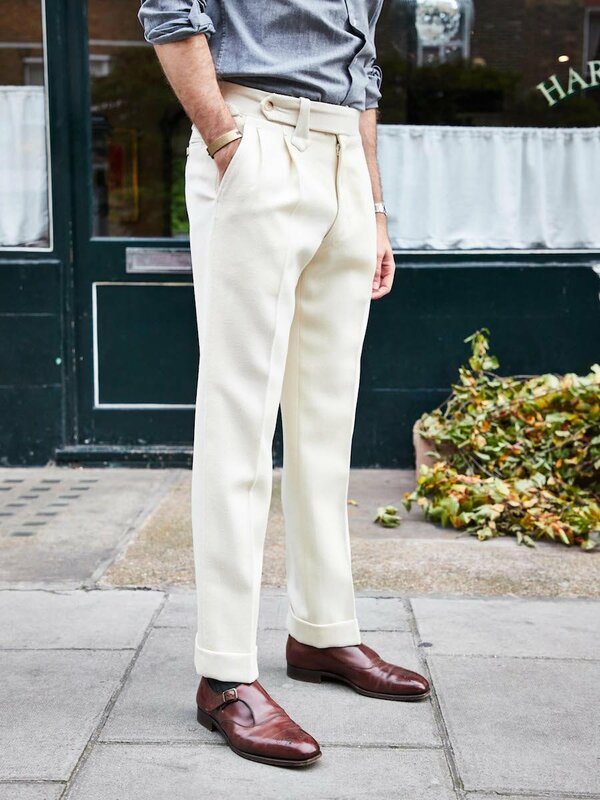 These trousers look great but doesn`t the extended waistband have what Alan Flusser once called (in the context of ties worn too long) phallic overtones? Ummm… not for me no. 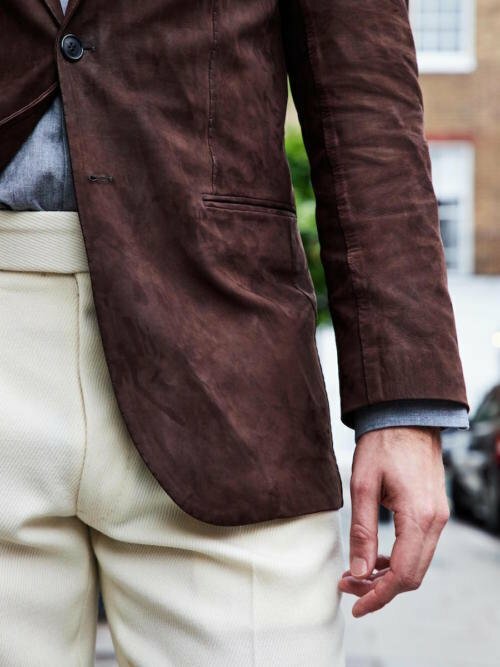 – This is the first time I have seen Neapolitan trousers with 2 pleats. I am interested to see if that solves the problem/challenge you describe as I have the same problem and I just ordered some double pleat flannels from Stoffa. 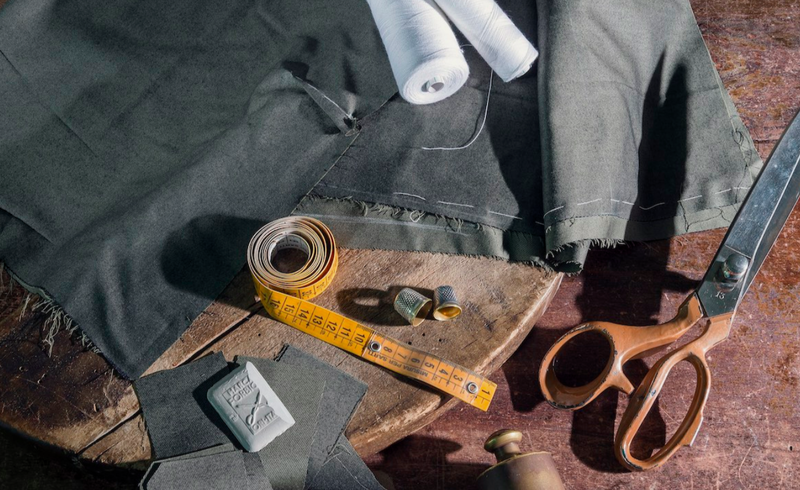 – Fabric for “shoulder” season trousers is tough, cavalry twill does wear cooler than flannel at the same weight. – In terms of flannel colors, I have a pair in lightweight (8-9 oz.) “fawn” from fox flannel that are great – great color and nice lighter weight, they have held up well. – I have also had the folding waistband issue on some trousers and it is frustrating – a weakness in the typical Neapolitan production methods for sure. – Lastly, Simon, I think it would further enhance the respect you have worked hard to earn from your readers if on every review you would disclose the general price you paid (full price, discounted price, free, etc). That would be great transparency. Without naming names how common is it for you to get a discount? Fairly common, but often not large. In the end, the only objection people have to discounts is saying that it ‘must’ influence the reviews. Yet all the evidence – all those reviews – shows that it doesn’t. Free things get lambasted, expensive full-price things get positive coverage. Always nice to compare it to every fashion magazine, and pretty much every large fashion blog, where the coverage itself is even paid for, and everything is bland and positive. If you can afford to pay full price, then why not just pay full price all the time and completely eliminate any questions on this topic? Because if a brand wants to give me a discount it’s a nice, generous gesture. And even if I insisted on paying full price would it stop people saying everything was free or I was simply lying? Intriguing… the cut of the leg is superb – a singularly unique, stylish and elegant commission. 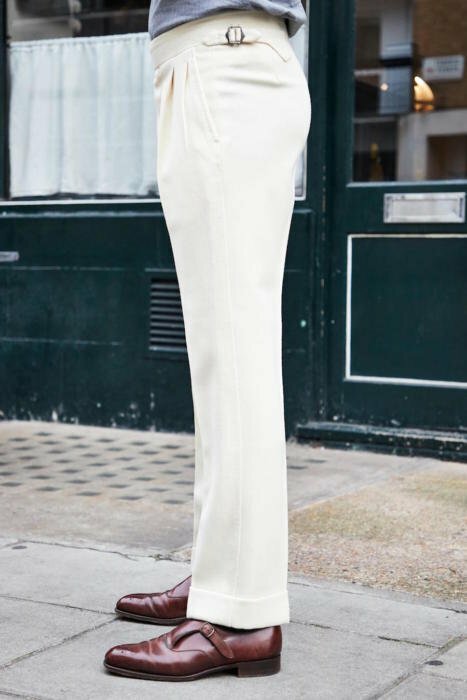 On the subject of trouser length (for tailoring and alterations); ordinarily between wide (9-10″) and slim (8-8.5″) what difference in length would you prescribe (1″?) to account for drape and fit over the shoe? Thank you in advance. Hard to be prescriptive there, as it’s partly a matter of taste, and varies with a turn-up etc (as it can’t be slanted much). 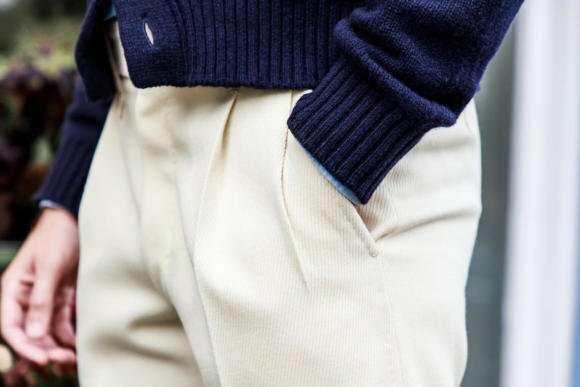 Most people want the trouser to have an unbroken line in the back, and a slight break in the front. You can go a little shorter, so there is pretty much no break, but that’s all, and the difference is a centimetre at most. What’s the weight of the fabric Simon? Also, can you put a date on the “vintage” label? It’s quite often said that vintage fabrics are heavier, harder weighing, and drape better- is that your experience with this cloth? I don’t know the weight to be honest, but probably 16-18 ounces. Nor the age, but I can ask Fox. It’s not decades old though. Great review and nice trousers, Simon! When will they travel to Hong Kong? It seems that they have not had any trunk shows in Hong Kong yet. Sorry, that was a mistake… I’ll remove now. Hope I didn’t get your hopes up! Simon, the trousers look great. Any reason why you did not choose forward pleats? Always a pleasure reading your reviews, and that cloth is really nice. I hope Fox revisit it. Simon, the subject of discounts has again arisen and seems an area of concern for some readers. However I’d like to suggest a middle way… to address transparency but aid manufacturer’s privacy why not state the average overall discount that you might receive; the probable average being 30- 40%. The question is therefore addressed, tranparency is given, privacy upheld and the discount, in the scheme of things not unreasonable. You may feel disinclined to broach the subject, as it might open the door to further scrutiny, but in my experience transparency always helps to avoid doubt. Sure, I’m happy to say that, and yes I’d say the average is about 25-30%. They overall look nice but the “belt loop” is a bit odd looking in my opinion. They also seem a bit expensive (at least in NY). Hi Simon, I love this cloth and have been searching quite a while for it. Is there a way to get onto a wait list in case Fox produces another run? I have been holding a swatch of Dugdale 8129 that when I tried to purchase it a number of years ago I was informed that it was out of stock and no longer in production. The cloth is very similar to the vintage twill used in your trousers although my Dugdale swatch leans more toward a buttery hue which I prefer. No, I’m afraid not currently. But if I hear from Fox what their plans are, I’ll put it on the site. As with each thing you feature, the wait for this article was worth every moment. I’ll say it again: these trousers are exquisite. That silhouette – slender in the middle and flaring out at either end – is very reminiscent of a stripped-down Greek marble column, giving you the chance to appreciate the material in its entirety. (Sorry if I’ve veered into poetic territory, Simon!) I imagine it works especially well with the texture of the vintage Fox cloth as an analogue to the marble. Does it lean more towards a smooth or a woollen finish? Subtlety even in the texture. Now that’s a great pleasure to wear. The journey does get somewhat easier over time, does it? You seem to be encountering fewer undesirable outcomes with your commissions. I’ve a long way to go still, but stories like this give hope. Simon, you reference : ” … shown in this post” with regards to the Fox Brothers wool but there is no link. 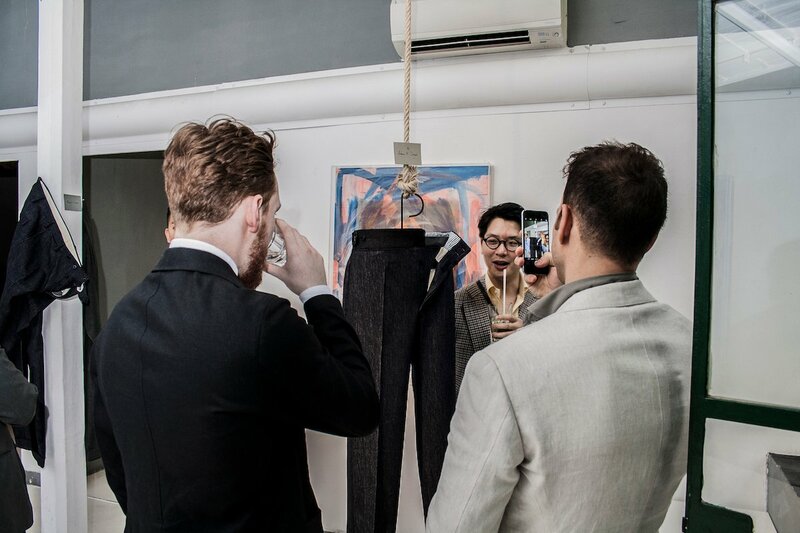 While I haven’t tried bespoke trousers myself, I’m curious what in terms of fit makes the premium of a $850 trousers worth it compared to a high end MTM brand like Rota or Stòffa for yourself? I fully understand people who have issues due to being bowlegged etc. but as far as I can tell this is not an issue of yours? The trousers looks lovely, fabric looks gorgeous. Personally I prefer the cut of your Cerrato trousers, as the flair of these ones reminds me too much of the dreaded boot cut jeans everyone wore in the 90s. Granted, this is based only really visible on the picture taken in profile, in all other pictures I wouldn’t have thought of it. Indeed proves your point of how little one can tell about fit based on a few pictures. Most of that premium on top of a good MTM is the hand finishing – which is of course the most time consuming part of the work. Bespoke also offers more options in terms of design options – waistband shapes, pockets, loops etc. There may be slight differences in the quality of fit, but only slight. You get a greater difference in fit between bespoke and MTM with jackets, generally. Its not strictly relevant to the review, but I just thought I’d say I have no problem with Simon taking discounts – because I think it is clear from the record of the site that even when receiving substantial reductions the reviews are fair and honest (see the Foster’s review). I don’t want to name names and cause trouble, but if you look at the advertisers I can see at least one that I have definitely never seen mentioned at all despite the fact they are paying for advertising. If we didn’t accept these advertisers, for which the rates are very clearly published, then there wouldn’t be anywhere near the content there is. I also do not care about discounts. But a potential problem could be the fact that tailors and shoemakers know abour PS and therefore work on Simons commissions with more attention and perfectionism than on those of a less important (and knowledgeable) customer. It is the reason why Louis De Funes used those funny disguises in the film where he plays a famous Restaurant critic. A lot of the industry find him a bit odd with a chip on his shoulder. But your probably right. The first piece of article. Simon, a Chinese menswear lover comments on your trousers. The major point is balance. He said that the width in the middle is a problem. Thanks. Sounds like it’s the question of the line of the leg that I commented on – which is of course subjective. Not necessarily a problem. 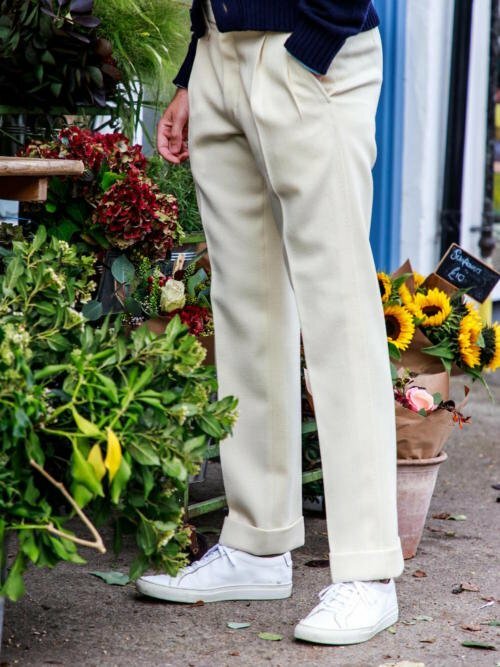 In nearly all the pictures of the white trousers, but especially the last one, there is a considerable amount of fold apparent just below the crotch. Is this normal, or signs of a poor fit? If normal, what explains it? I suppose it just goes to prove the point you’ve made in other contexts, namely that you can’t judge fit from photos. 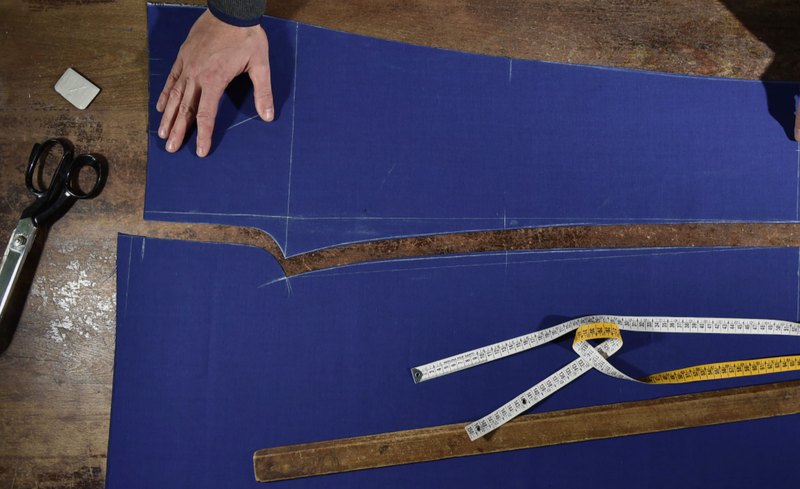 Two critical issues a relevant to the cutting of the pleated trousers.1: the waist needs to be marginally over sized .2: An abundance of ease is required to allow the pleat to lie flat+/- 20 percent of the hip measure is about right. Of course there is a litany of other subtleties such as keeping the topside as small as possible and crookening the underside which relieves tension on the pleat and gives a better run on the seat seam. 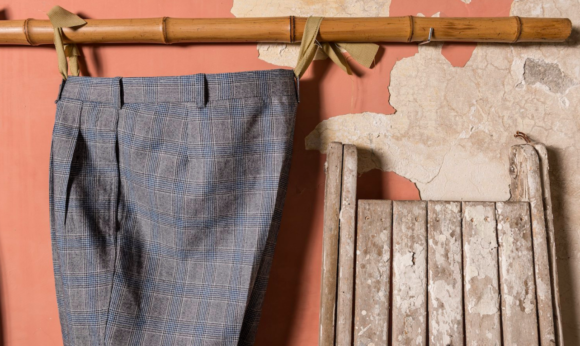 Look to Dege and Skinner archives for the Holy Grail of pleated trousers . Thanks for this, bespoke trouser-makers are really quite underappreciated in my part of the world (Singapore)! I have recently commissioned a pair with Igarashi and I was wondering how do Neapolitan makers like Cerrato and Pommella compare to Igarashi. Again, appreciate your work on shedding light on bespoke menswear! Thanks Jay. The Japanese are certainly as good, if not better, than the Neapolitans in this regard. I haven’t had anything made by them, but the attention to detail and finishing are among the best. Simon, how do your Italian trousers differ in fit and style from those from A&S or other English makers? Thank you Simon for the excellent review. Giancarlo and Lino were in San Francisco today and I ordered a pair of trousers in a very pale buff colored wool denim. I am very much looking forward to seeing how they turn out. If I may, I have a comment about the ]earlier poster who suggested that tailors might provide better service to you than to “regular” customers. I have been and off and on client of bespoke tailor for more than 20 years, when I had my first bespoke jacket made by the late Keith Fallan. I am not a rich man but I recognize the great true value of bespoke clothing. Over the years I have also learned that buying bespoke clothing is a process of trial and error. When it is not right it is maddening. When it is right it is truly artwork that one wears. Of course you will have a better result than most. Not because you have blog. Rather, because you are an experienced customer you are no doubt better able than most to communicate your needs and desires. 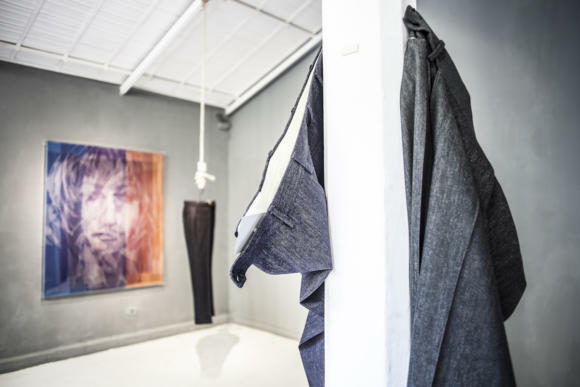 Bespoke clothing is an art that takes more than a little practice for both tailor and customer. It is my view that the time, effort, and occasional disappointment is worth the effort. I don’t give a rats patoot if you get a discount, or free clothes for that matter. I think your reviews are honest and that is what matters. They day I no longer think this is so I will stop looking at your blogs. Moreover you support craftsman and I appreciate that. Thank you. Thank you Lawrence, that’s great to hear. Nice description of bespoke too. Would you have any back shots of this? I have a little pudge in the belly just like you and I was wondering if the waistband height can aid in covering/masking that extra volume in the stomach area. The Neapolitan makers all employ taller waistbands and I am wondering if they have a slimming or fattening effect. For me, it is uncomfortable to wear anything above my belly button due to my bell, but I definitely am fine with having the rise above the hips for sure. Curious to hear your thoughts on this! 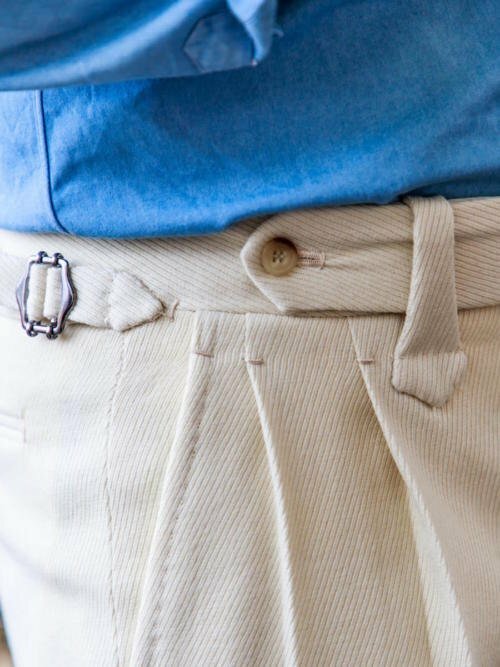 When you say that pleats used to open and stay open, do you mean open all the way to the top of the waistband where there is a stitch? Sorry for being pedantic, aren’t pleats supposed to open most of the way when you sit down or move? Are you saying yours stayed fully open when you were standing still ? 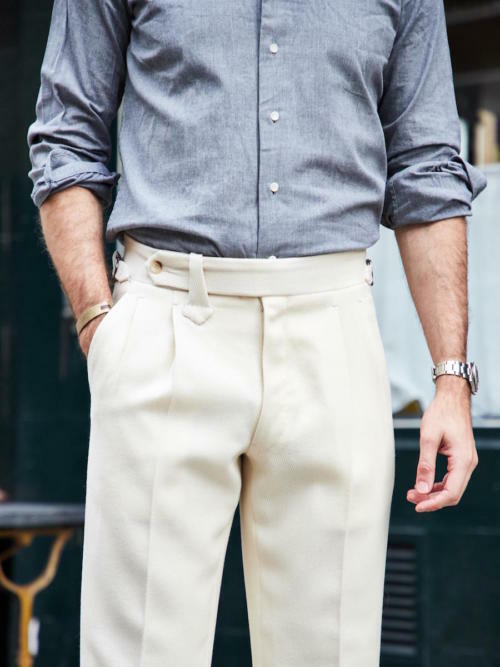 Can trouser pleats be taken out and made up as flat fronted?